KLAMATH FALLS, Ore. - The Oregon Tech Lady Owls (2-3 in CCC and 9-6 overall) took down the Multnomah Lions (0-3 in CCC and 0-13 overall) by a score of 76 to 39, Friday night on Danny Miles Court. The game opened up with the Lions hitting the first two shots of the game and keeping the home team scoreless for the first 2:00 minutes. The Owls soon began to find their stride tying the game up and going ahead on a 3-pointer from junior guard, Megan Morris. After taking the lead, the Owls would not give it up for the remainder of the contest. The first period of play ended with the score at 17-10. The Second quarter saw the Lady Owls step their game up a notch, adding 20 points on the board, while holding the visitors to just 7 points. The score sat 37-17 heading into the halftime break. To start out the second half of play, the Lady Owls continued to stretch their lead, finding more opportunities in the post and running the court. Both teams had the 3rd quarter as their highest scoring 10:00 minutes of play. Tech slightly doubled the Lions score putting up 25 points to the visitors 12. The final stanza had both teams scoring in the teens, but Tech had stretched their too far ahead to be caught. The final buzzer sounded with the score 76-39. The Lions were led by Rachelle Tau with 14-points, while Valerie Wakefield added 7 rebounds and 7 points. 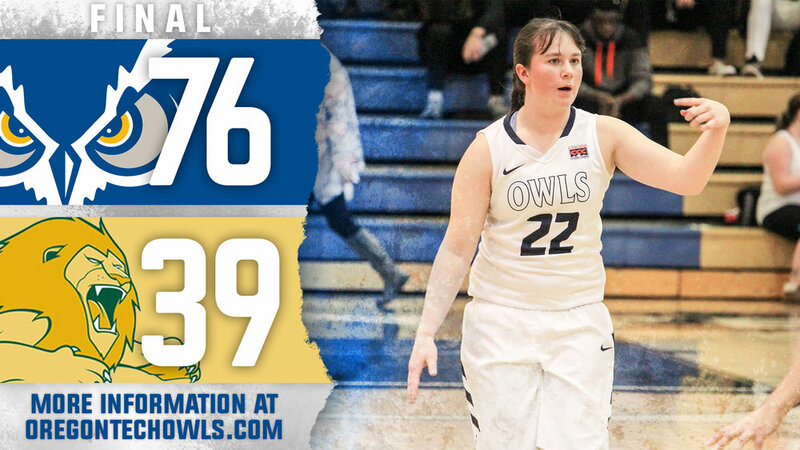 For the Lady Owls, all thirteen rostered players saw the court and scored, but three athletes were in double digits, as Mikaela Shumaker led the charge with 14-points. Behind her was Megan Morris with 13-points, while Baylee Tony added 10-points and 7 rebounds. The Lady Owls will back in action on Saturday evening at 5:30pm, as they take on Warner Pacific College on Danny Miles Court. Follow the Hustlin' Owls for the latest news, stats and updates at www.OregonTechOwls.com, Twitter and Instagram @OregonTechOwls.